Judea, Judaea, or the Kingdom of Judea (Judea means 'Praise and in Standard Hebrew, Yahuda) is a term used for the mountainous southern part of the historic Land of Israel, an area now divided between Israel and the West Bank, and, in a few geographical definitions of Judea, Jordan. In modern times, the name "Yehudah" may be used by Hebrew speakers to refer to a large southern section of Israel and the West Bank, or in the combined term Judea and Samaria to refer specifically to the West Bank. The area was the site of the ancient Kingdom of Judah and the later Kingdom of Judea, a client-kingdom of the Roman Empire. 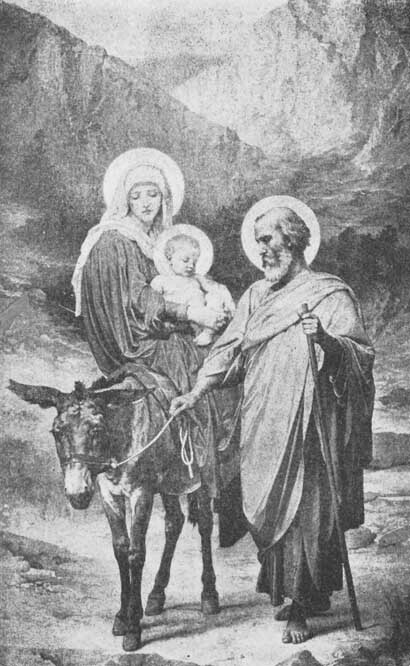 The name Judea is a Greek and Roman adaptation of the name Judah and was originally applied to the whole of historic Palestine, but by the time of the New Testament it had been limited in scope to the south of the region. 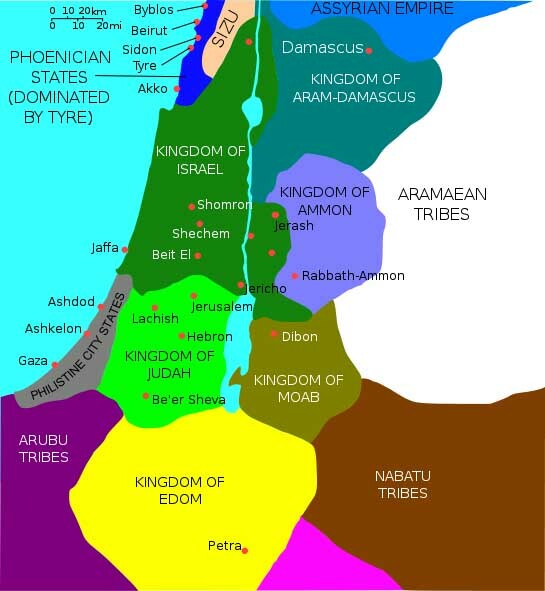 The original boundaries were Bethsur (near Hebron, on the south; Bethoron (today Beit Ur al Fawka in the West Bank), on the north; EmaŸs, on the west (a few miles west of Jerusalem); the Jordan River on the east. The historian Josephus used a more expanded definition, encompassing the lower half of what is now the West Bank in the north down to Beer Sheba in the south, and bordered on the east and west bey the Mediterranean and the Jordan river. 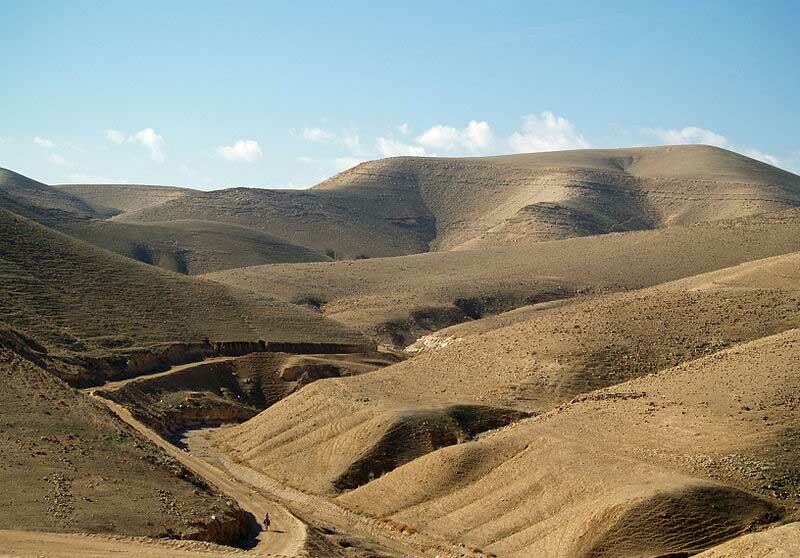 Judea is a mountainous and arid region, much of which is considered to be a desert. It varies greatly in height, rising to an altitude of 1,020m (3,346 ft) in the south at Mount Hebron, 19 miles (30 km) southwest of Jerusalem, and descending to as much as 400m (1,312ft) below sea level in the east of the region. Major cities in the region include Jerusalem, Beitar Illit, Bethlehem, Efrat, Gush Etzion, Jericho and Hebron. Geographers divide Judea into several distinct regions: the Hebron hills, the Jerusalem saddle, the Bethel hills and the Judean desert east of Jerusalem, which descends in a series of steps to the Dead Sea. In ancient times the hills were forested and the Bible records agriculture and sheep farming being practiced in the area. Animals are still grazed today, with shepherds moving them between the low ground to the hilltops (which have more rainfall) as summer approaches. The region dried out over the centuries and much of the ancient tree cover has since disappeared. Human settlement in Judea stretches back to the Stone Age and the region is believed by paleoanthropologists to have been one of the routes through which homo sapiens traveled out of Africa to colonize the rest of the world around 100,000 years ago. Archaeological evidence of human settlement dates back 11,000 years in the case of the city of Jericho, believed to be the oldest continuously inhabited settlement in the world. In historic times, the region was inhabited by a number of peoples, most famously the Israelites. Judea is central to much of the narrative of the Torah, with the Patriarch Abraham said to have been buried at Hebron in the Tomb of the Patriarchs. In historic times, Judea was ruled by the Kingdom of Judah and later by the Kingdom of Judea, a client-kingdom of the Seleucid dynasty of Persia. It gained its independence briefly in the mid-2nd century BC and again from 140 BC. 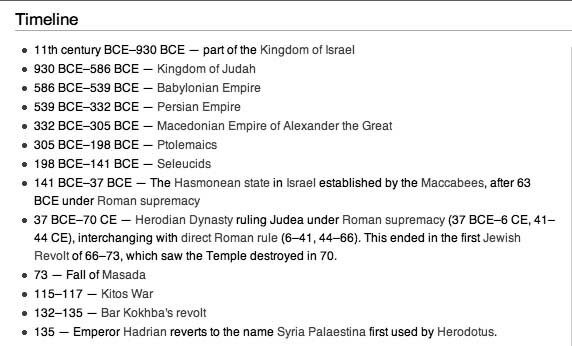 During the 1st century BC Judea lost its autonomy to the Roman Empire by becoming first a client kingdom, then a province of the Empire.For the history of Judaea under Roman rule. 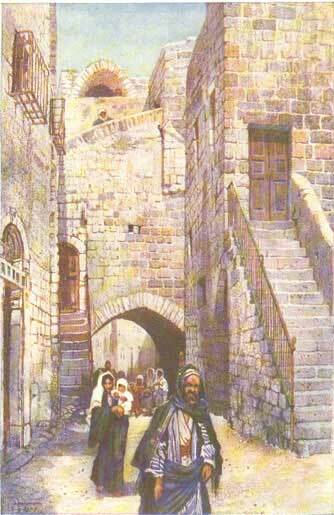 The region was conquered by Muslim Arabs in 640 but fell to the Crusaders in 1099. Arab control was restored in 1291. In 1516, the expanding Ottoman Empire took control of Judea, which it retained until the British defeated the Turks at the Battle of Megiddo on the site of the Biblical Battle of Armageddon.It then became part of the British Mandate of Palestine, with the territory of Judea split between British-ruled Palestine and the autonomous Emirate of Transjordan (a territorial unit within the Mandate, later to become the independent Kingdom of Jordan). The area remained part of Jordan when the kingdom became independent in 1946, with most parts of Judea within the old British Mandate territory being administered by Jordan following the 1948 Arab-Israeli War. It was annexed by Jordan in 1950 (though this annexation was recognized only by the United Kingdom and Pakistan) and remained part of Jordan until the 1967 Six-Day War, when it was taken by Israeli forces. It is now generally known outside Israel as the West Bank, though within Israel it is often still referred to as Judea in reference to its Biblical past.